Peanut butter, marshmallows, and chocolate . . . could these blondies be any better? This recipe comes from our cute friend Stephanie who blogs over at BackForSeconds.com. 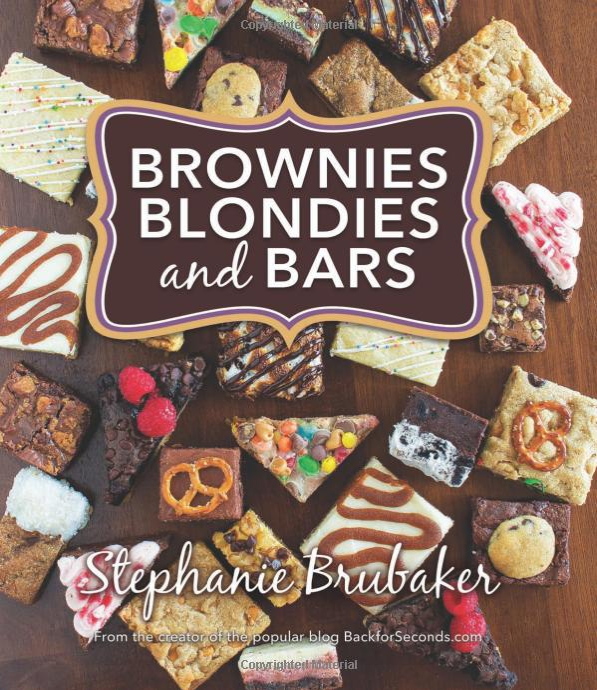 She just released her cookbook, Brownies, Blondies, and Bars. This book is loaded with all my favorite things – I love making desserts in a pan because they are so fast to throw together and there are so many fun variations that I can’t wait to try (like Nutella Brownies with a Pretzel Crust and Cinnamon Roll Blondies!). This is definitely a book that you are going to want to check out! Line a 9x13" baking pan with foil, leaving enough room to hang over the edges. Spray lightly with cooking spray. In a mixing bowl, cream together the butter, peanut butter, and sugars. Add the eggs, one at a time, mixing between each addition. Add salt and baking soda and mix again. Add flour, mixing until just incorporated. Stir in chips and marshmallows. Spread into the prepared pan. Bake on the center rack for 20-23 minutes or until golden and edges start to pull away from the sides of the pan. It will be slightly jiggly from the marshmallows, but will set up as it cools. Do not overbake. Allow to cool completely (it will be hard to wait, but I promise it's worth it!) before cutting. These look delicious. I'll be pinning these for later! These look yummy! 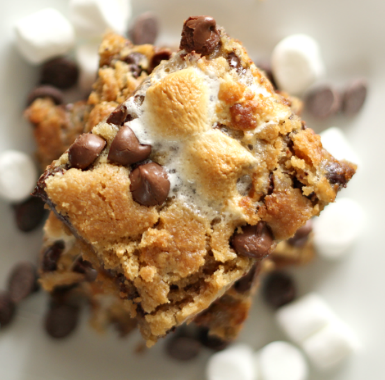 Can't go wrong with blondies! I need the brownies in 2 days but don't have time to bake much tomorrow night. Is it better to refrigerate the raw batter or the baked brownies overnight? Or would the baked brownies just be ok in a tightly sealed container for 2 days? You could store them in an airtight container in the fridge for a day or so. Let set at room temp before serving. These are baked in a 9 x 13 inch pan. You could cut the pan 4 brownies across and 6 brownies down which would equal 24 good sized brownies. We cut the pan into 28 squares. Could this recipe be cut in half and cooked in a smaller pan? I'm sure you could cut the recipe in half and bake in a smaller pan. You would have to watch it closely for the cooking time. We have not made a smaller version so we don't have the correct cooking time for you.